This horse has some lovely traditional tack - woven wool saddle cloths with pom-poms, metal ornament on the bridle & breastcollar. Tusheti is a rugged, mountainous region in northeastern Georgia. Photo from Lydia Ilona on flickr. So you like to trail ride? Maybe you do some endurance riding? Yeah, yeah, that's fun. But have you ridden across Albania? Didn't think so. Take a look at this adventure - a couple riding from the wild mountains in the far north of Albania all the way to the southern coast near Greece. Albania, due to years under a very isolating and repressive government, is one of the least developed European countries. There are wild forests and mountains, and there is still a heavy reliance on horses for agricultural work and transportation, although with economic growth these things are changing. The website documenting the TransAlbania Ride, which took place in 2007, has links to dozens of high quality video clips showing scenes from the grand adventure. Of particular interest to rare breed fans is footage of the little-known Albanian horse - both the small, sturdy mountain horse, and the taller, leaner lowland horse. The couple undertaking this adventure - Robin and Louella Hanbury-Tenison - are known for previous long horseback expeditions, including across France, along the Great Wall of China, and many others. This performance is unusual and lovely - a dance between horse and rider. With careful study you can see the cues in the dance - often Ms. Fedotova's arms are moving in bold gestures, but it is her legs which are actually cueing the horse. Other times it is the position or movement of her whole body which guides the horse's movements. This is a really beautiful performance. This is a fun video, probably from Italian television, of a famous Cossack stunt riding troupe. Nearly ten minutes of pretty impressive trick riding. 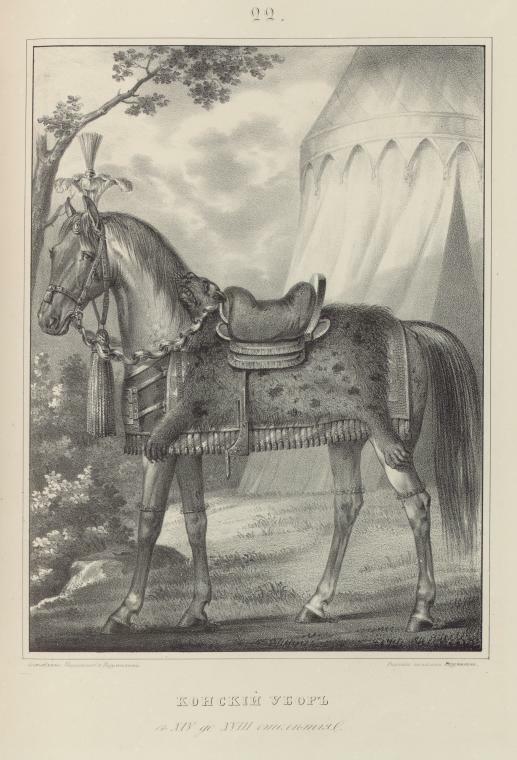 This illustration, entitled "Horse Trappings, Fourteenth to Eighteenth Centuries" depicts a military horse with an entire bearskin (head and all!) as a saddle pad. Unfortunately there is no detail about the design and use of this exotic saddle pad. I noticed the horse is also wearing decorative "bracelets" on all four legs, just above the knees and hocks. Perhaps they are bells? The plume on the horse's head is quite elaborate. Image from the New York Public Library's online digital gallery.